This sky map shows where to find Mars at 8 p.m. ET under clear conditions from the northeastern U.S. Mars will NOT appear as large as the full moon, despite an Internet hoax's annual claim. The infamous Mars hoax that widelycirculated on the Internet since its first appearance in the summer of 2004 is rearingits head again. It comes in the form of an e-mail message titled "MarsSpectacular," originating from an unknown source. The Mars hoax e-mailhas been passed on to countless others who haven't been able to resistforwarding it to their entire address book. In some cases, the message hasbeen turned into a full-blown PowerPoint presentation, accompanied bysnazzy-looking graphics seemingly providing a sense of authenticity to themessage. The e-mail declares that on thenight of Aug. 27, the planet Mars will come closer to Earth than it has in 60,000years, thereby offering spectacular views of the Red Planet. Thecommentary even proclaims, with liberal use of exclamation marks, that Marswill appear as bright as (or as large as) the full moon. The problem is that "Aug.27" is actually Aug. 27, 2003. Mars made a historically close pass byEarth that night (34.6 million miles, or 55.7 million km). The Hubble SpaceTelescope used the opportunity to make some greatimages of Mars. But even then, to the naked eye Mars appeared asnothing more than an extremely bright yellowish-orange star, not at all likethe full moon. 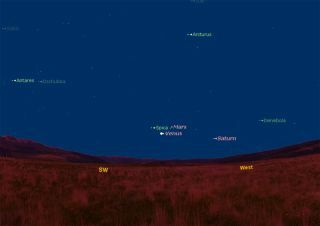 This Mars sky map shows thelocation of Mars in the night sky on Friday, Aug. 27 at 9 p.m. EDT as seen fromthe northeastern United States, weather permitting. As Neil deGrasse Tyson, directorof New York's Hayden Planetarium, puts it: "The proximity of Mars toEarth in 2003, while indeed closer than in the past 60,000 years, was nonethelessno more meaningful than me swimming a hundred yards out from the Californiacoast (instead of my usual seventy yards) and then declaring to the world,"I have never been this close to China before." This year Mars is actually muchdimmer and far less conspicuous than in 2003. If you want to find Mars rightnow in the early evening sky, you should use the brilliantplanet Venus as your guide. Face the west-southwest about 45 minutesafter sunset. You can't miss Venus. Mars willbe situated about 2 to 3 degrees above and to the right of it. As a reminder, yourclenched fist, held at arm's length measures roughly 10 degrees. So Mars isabout one-third of a fist above and to the right of Venus. Currently, Mars sets at about thesame time as Venus, about 90 minutes after sundown. But at magnitude +1.5, Marsis about six magnitudes and 250 times less bright than Venus, so you might needbinoculars to pick it up in the twilight sky. ?? In terms of actual size, Mars(approximately 4,213 miles, or 6,780 km in diameter) is almost twice the sizeof our moon (about 2,160 miles, or 3,475 km). But the great distancebetween Mars and Earth never allows it to appear anywhere near as large as themoon in our sky. The average distance of the moonfrom Earth is 238,000 miles (382,900 km). For Mars to appear to loom aslarge as the moon does, it would have to be about twice the Moon's distance, orroughly 476,000 miles (766,000 km). In fact, this week the Red Planetis 198 million miles (318 million km) from Earth. To give you some idea ofhow many people have fallen for this over the years, back on Aug. 27,2007, one of nature's great sky shows, a total eclipse of the moon, occurred acrossthe United States. On the day before the eclipse,the Hayden Planetarium's Answer-Line expected a heavy volume of phoneinquiries from the general public concerning advice on how to view theeclipse. Fifty-one calls were logged, but amazingly, onlythree concerned the upcoming eclipse; the other 48 were calls (some breathless)asking where and when would be the best times to see Mars when it was due toappear as large as the moon. Not a few of those calls actuallystarted off chiding the planetarium for not scheduling a public viewing sessionfor the ?Big Mars Event!? So, plain and simple, if you havealready received this infamous Mars e-mail ? or eventually receiveit during the next few days ? be advised that it is totally bogus.And please, don?t pass it on. Joe Rao serves as an instructor and guest lecturer at NewYork's Hayden Planetarium. He writes about astronomy for The New York Times andother publications, and he is also an on-camera meteorologist for News 12 Westchester,New York.